Liberia's first polls after 14 years of bloody civil war might see a woman elected president, in what would be a first not only for Liberia but also for Africa. And with more women than men registered to vote, they should have the final say at the ballot box next week. It is no surprise, then, that sisters in this impoverished West African nation are in jubilant mood. “For the first time in history, women are at the forefront of the elections,” said Leymah Gbowee, head of the Women In Peacebuilding Network. The woman leading the charge is Ellen Johnson-Sirleaf, affectionately dubbed “the Iron Lady” after Britain’s groundbreaking prime minister, Margaret Thatcher. Sirleaf, a Harvard-educated economist with a resume boasting stints at the UN, World Bank and Citibank, wants to break a male stranglehold on power that has lasted almost 160 years. During Liberia's civil war, faction leaders used to rally their drugged-up foot soldiers with chants about how the enemy were women. Today, Sirleaf’s supporters have turned that on its head. The cry of “Ellen is our man!” follows the 66-year-old on the campaign trial. It is Sirleaf’s second attempt at the presidency, after losing to Charles Taylor by a vast margin in polls held in 1997 during a break in the civil war. This time around, she is one of the clear favourites among the 1.35 million Liberian voters. “Men are going to work with us, men are going to help us to make history,” Sirleaf told thousands of supporters packed into a football stadium in downtown Monrovia on Thursday. Anthony Philips, a 29-year-old student at the University of Liberia, has been won over. “We have seen nothing from the men who have been president. All we have seen is war, suffering, and unemployment. We should try a woman to see what she can do,” he yelled, pointing to the Sirleaf stickers stuck on his cheeks and all the way up his arms. For others, like James Hallowanger, who has been working as a civil servant for a transitional government widely-accused of rampant corruption, gender is not a vote-clincher. Many female supporters, though, are bowled over by the idea of a woman breaking through. Away from the Ellen bandwagon, women are expected to turn out in droves for the 11 October vote, billed as the final chapter in Liberia’s transition to peace and democracy. Catarina Fabiansson has been closely involved with post-crisis elections in Afghanistan and East Timor and is now working for the UN’s electoral division in Monrovia. But it is not a rosy picture across the board. “There are other respects in which female participation is not as extensive, especially in terms of breaking through the party hierarchy,” said Ashley Barr, the country director for the Carter Center, which is providing observers for the elections. Margaret Tor Thompson joins Sirleaf in the presidential race and there are 108 other women running for seats in the senate and lower house of parliament. But they account for only 14 percent of those running for office. That is not even half of the 30 percent target that was endorsed by Liberia’s electoral commission but not made a legal requirement as some women’s groups had wanted. Gbowee, the head of the women’s network, is adamant that the stigma about women in politics has faded. But, she says, time pressures and financial constraints can still prove big obstacles for women whether they are wannabe politicians or potential voters. During voter registration, for example, she noticed female market traders in Monrovia were reluctant to go and sign up for fear of losing money. Some analysts also worry that much of the hands-on involvement in the political arena is symbolic. And even when women do break through the glass ceiling, the going is tough. There is, in fact, one Liberian woman to have already made it to the top. 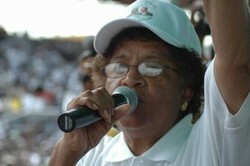 Although she was not elected, Ruth Sando Perry was interim leader for almost a year during a lull in the war in the mid-90s. Sitting on the sidelines of Sirleaf’s adrenalin-charged rally, a weary-looking Perry told IRIN what advice she had for the woman who may soon be the continent’s first elected female leader.